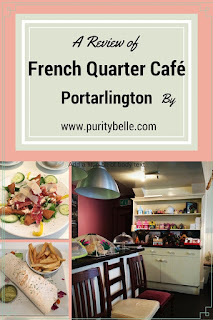 This post is a bit of a mix of things, I wanted to update a little on my candles and I absolutely have to recommend the lovely French Quarter Cafe in Portarlington, so I'll tell you a little bit more about that further down. First of all, as I mentioned in my previous post A Crafter's Guide to Selling at Christmas, this is a crazy busy season for anyone who makes their products - it's a busy season for everyone, but making products by hand is time consuming and rushing to get stock done and have everything organised can be a bit fraught! I'm feeling reasonably on schedule and this Saturday I dropped stock off at An Siopa Nollaig in Portarlington. This is a pop up shop run by the lovely KellyAnne - she and her friend Kimberly ran it last year, also, in the run up to Christmas, and I was very happy to be asked to give some stock for the shop again this year. I was also due to head to the Tea Rooms at Duckett's Grove for 2 p.m so we had a little bit of time to spare and Mark and I decided to get some lunch at The French Quarter Café. We had been before so knew that it was really nice and we weren't disappointed! It was delicious, with crispy bacon and lots of crunchy veg and leaves, so good. The decor is simple and tasteful and very much to my liking. Best of all though, is the wonderful presence of the owners, Eamon and Richard. They really couldn't be nicer or more welcoming and this is what I feel local business encapsulates - that genuine warmth and personal touch is what it's all about for me. We had a great chat with Eamon, he is a big supporter of local business and very much has the same ethos I have about developing local economies and keeping our towns alive. Luckily we weren't gone too far and Eamon and Richard couldn't have been more charming about my gaffe. I'll be very careful to leave with just one phone next time! We headed off to Duckett's Grove then, Madeleine of the Tea Rooms had kindly offered to display some of my products and she was in the full throes of organising things for Afternoon Tea (which was due to start the next day) when we arrived. She still made time to offer us a delicious cup of coffee and we had a lovely talk. Madeleine is one of the many people who were supportive and sent good wishes when I was feeling truly ill and she's such a lovely person and a whirlwind of energy. This looks super cute! I could use some cute coffee right about now! That chicken and bacon salad looks divine! Love your candles too. Nice packaging. I love the candles. It looks awesome. The candle looks fab I am obsessed with candles. I love your photos of the food the tea room looks like a lovely place to go. I can't help but to drool over those food. It looks so delicious. Glad you had a great time and the place seems inviting. I worked in a candle factory one summer and it was a hard job!! I always loved how I smelled when I came home and I imagine these smell amazing!! The decor is beautiful and I love the look of the vegetarian burrito. What was in it?